Weekend cooking is my favorite! Especially during the spring time when Jereme washes off the back deck and we get to hang out and enjoy the view. It's also his favorite time to grill!! So on this nice weekend, we grilled scallops, beef skewers, chicken.....then I made the sides. This was my first time to make this side dish. I had it at my friend Rhiannon's house the first time I ever tried it.﻿ She & husband Doug have my DREAM kitchen, by the way!! You may have seen their company trucks around town - they're black & white and say DUKE CUSTOM CABINETS. So their kitchen has a warming drawer, Viking range, a refrigerator adorned in custom cabinetry, sconces above the stovetop with hidden spices inside. If you want the ultimate cabinetry experience, Duke Custom Cabinets is the way to go from kitchen to bedroom to all throughout your home - even your garage!! 1 12 oz.Bag of Private Selection Green Beans from the produce section. 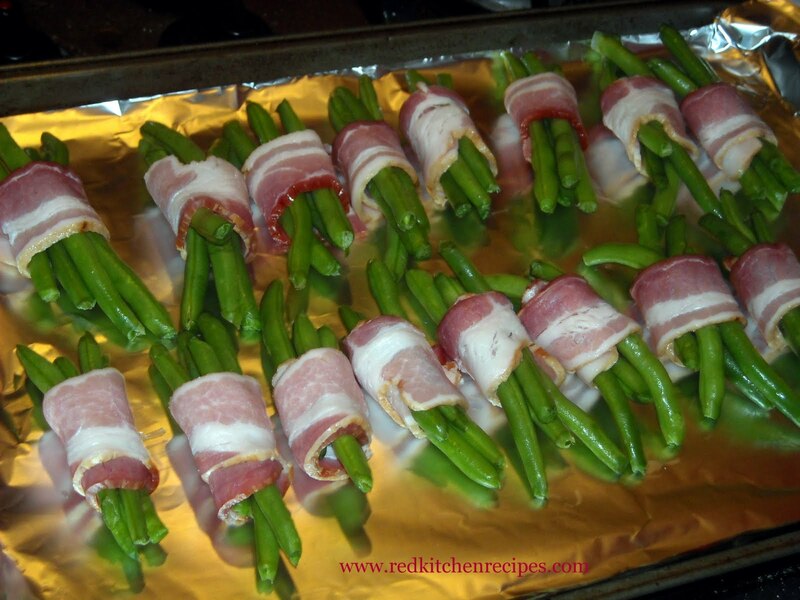 Wrap the shortened slices around 4 green beans each. Lay seam side down onto a foil - lined pan. Cover with foil, and bake in oven for 30 minutes. While cooking, prepare sauce: melt 1/2 stick of butter with 1/4 c of brown sugar on medium low heat and wisk. Uncover, then bake another 15 minutes. Drizzle with butter & brown sugar mixture. In My Father's Daughter, Gwyneth Paltrow makes such an incredible point: letting your children cook with you really buoys their sense of accomplishment as well as their connection with you. 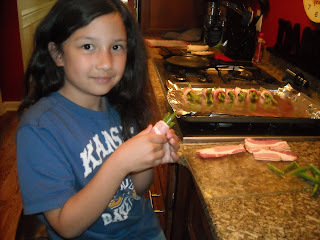 Here's Gianna - making bundles for me. She was so excited when I asked if she wanted to help, and she did such a great job, I realized that I can be less tired at the end of the day with such enthusiastic helpers!! P.S. Sasha did also help, but then Jereme put her on towel duty while he was washing dishes. Soon, though, I'm sure I'll involve both girls in my cooking again. Note: This is one of those recipes that everybody makes. I didn't invent it, and I don't claim that I did. I have seen it in dozens of books and online recipes. I took what I like out of each recipe, and I've simply shared it here. hi I love the pictures and the food thanks mom! we have lots of great food in our red kitchen. P.S. I am the girl with the kansas shirt on. Shopping for RTA kitchen cabinets or other products online? Visit the Cabinet App - Kitchen products online. The online store has made easier to place an order for RTA kitchen cabinets, drawer boxes, organizers, vanities, and doors etc. Register now and buy your desired kitchen products! internet, and broadband are not. At present it is widely used as a back upp service for avokding larges losses if ADSL connectivity or caable broadband fails. surrf the web for longer durations as well as for night packages. to finding their oul mate. Major thankies for the blog.Much thanks again. Great.elektrische Pfeffermühlen oder auch electric Peppermills. I love making different changes in my room and I've never been satisfy with one for very long. The kitchen too can make sense with arrangements like adding a garbage system to the septic tank to make draining waste easier. Thanks for the inspiration.